At Feedback Labs we talk a lot about closing the loop, but how do you initiate a feedback loop in the first place? Setting yourself and your program up for success starts with smart design. DeCODE (the Global Delivery Initiative’s newest product) is a tool that can help you do just that. Imagine you’re starting a new health clinic in India. You know you want to use mobile reporting technologies to gather data and interact with your patients. What you don’t know is how reliable the IT infrastructure is or how you might control the quality of the data you collect. As you begin designing your platform, DeCODE (Delivery Challenges in Operations for Development Effectiveness) can get you thinking about the things you need to address to close your loop effectively. And often, they are barriers you might not know to look for. DeCODE can help you predict the likelihood of problems you might confront, based on similar projects in your sector and region; identify the people who have troubleshot those problems before, and direct you to specific case studies and toolkits to reference. Suddenly, you have in your own hands the power to understand what inter-government relations you might have to navigate to ensure a reliable telecommunications network, or what indicators might be unrealistic upon implementation. DeCODE presents a potentially unprecedented way for any implementer (from a local grassroots initiative to a USAID contractor) to knock on the door of the World Bank – and more importantly, have them answer. This initiative has the potential to transform the way implementers design programs. Such a shift is clearly in high demand. The deep collaboration among the seven unique organizations attending the DeCODE LabStorm illustrated the excitement for this product. Organizations working on analogous platforms across the FBL network came together to offer their expertise, including Charity Navigator, Feedback Commons, GlobalGiving, and Ashoka. FBL is interested in learning more about how DeCODE might offer the opportunity for these organizations to communicate across platforms. 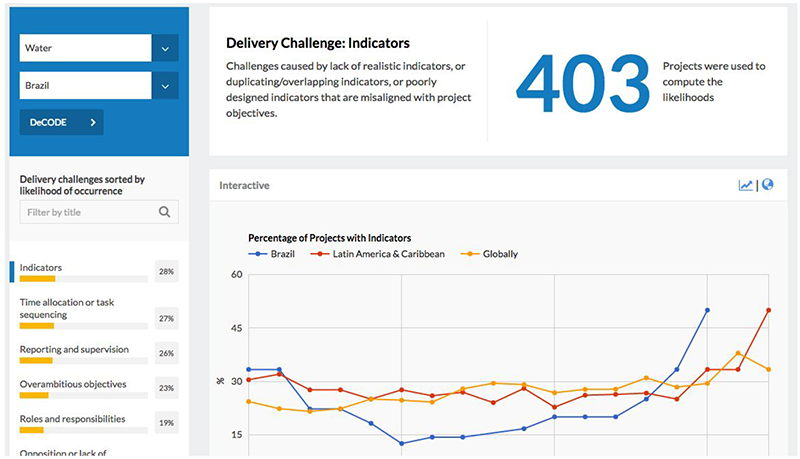 The DeCODE platform compiles 54 keywords to create a common language, or a taxonomy, of anticipated delivery challenges across stakeholder, context, and project barriers. This common language, combined with an increase in both the data’s quantity and quality, DeCODE is able to present the user with case studies to pull from and individuals to connect with. For example, prior to a development organization embarking on a WASH project in Brazil, they can enter a combination of keywords in DeCODE that will provide them with a report of the most frequently faced challenges in implementing this kind of project in that region, along with a directory of vetted experts they can reach out to for advice. DeCODE will also suggest a curated set of resources and tools that may help you overcome those predicted barriers. Incentivize learning. Currently, the delivery challenges represented on the platform correlate to Task Team Leader’s work within the World Bank, but what about other users? Collaboration with other existing platforms could not only expand the network of users, but enhance the experiences of all users. For example, GlobalGiving has Project Leaders around the globe who would benefit from the platform’s information as well as feed new principles about tackling design challenges into the system; these Project Leaders could additionally be rewarded on the GlobalGiving site for utilizing DeCODE’s services. Establish a community first, tool second mentality. GDI is building a tool with enormous potential, but can avoid the pitfall of “build it and they will come” by focusing on community first. It’s admirable that they’ve gotten so many expert implementers to agree to be part of a public roster, ready and willing to lend a hand to help ensure that new projects have well designed foundations. How can DeCODE create community among those expert implementers, as well as with the users and potential users of the platform? It’s tough to talk about time’s we’ve failed and it’s sometimes harder to admit that we don’t even know where to start in overcoming a potential challenge. Charity Navigator highlighted the roadblocks they faced when asking nonprofits to report their failures, and the LabStorm participants as a whole emphasized the value in creating a community of trust to bolster DeCODE’s value. Provide simple “on-ramps” to encourage use of the platform. This past October Feedback Labs held our second annual Feedback Summit. Fueled by excitement to address feedback from last year, we left newcomers to the community scrambling to feel caught up. It can be a difficult thing to gage where in their knowledge and development new users are, and how to provide appropriate resources for all skill types. How can we help DeCODE learn from us, and tailor itself to both new and recurring users? We look forward to learning from GDI as they continue developing this important tool, and we welcome your feedback in the process. Reach out to GDI directly at [email protected], contribute your thoughts below and check back here, on the Feedback Labs Blog, for updates. Over the past few years, LabStorms have proven to be an effective tool for helping those in the Feedback Labs network surface and work through challenges in closing feedback loops. We are excited to announce a new stream of LabStorms, which will begin in January 2017 and will focus specifically on data interoperability challenges. These “DataStorms” will be open to any organization interested in communicating data between platforms, especially data that helps close feedback loops or rewards others for doing so. Interested? Email Joanne at [email protected] for more details! The Global Delivery Initiative is a collaborative effort to create a collective and cumulative evidence base of delivery know-how to inform development practice and improve implementation. The GDI and its partners support practitioners on the ground to adapt to dynamic contexts and solve stubborn delivery challenges. Maria González de Asis heads the Science of Delivery team at the World Bank that focuses on collaboration across the international development community to forge a new frontier in development efforts worldwide around adaptive implementation. She is also the Co-chairman of the Global Delivery Initiative. She manages different work streams of the Science of Delivery team, including: operational support to task teams through, among others, the Model Engagements task force; research and analysis of delivery challenges hindering implementation; the Global Delivery Library; the “Learning from Projects” and knowledge experiments.